The next milestone is now the deadline for forming coalitions next week. It is quite remarkable that despite the regional and sectarian tensions brought about by the Syrian crisis, Iraqi Shiites are in no rush to form a unified alliance, quite unlike the situation in 2009. As of today, it seems more likely that there will be a Maliki front and one or two challenging coalitions. Such a scenario would in itself send a positive message at a time when political violence continues at an elevated level. 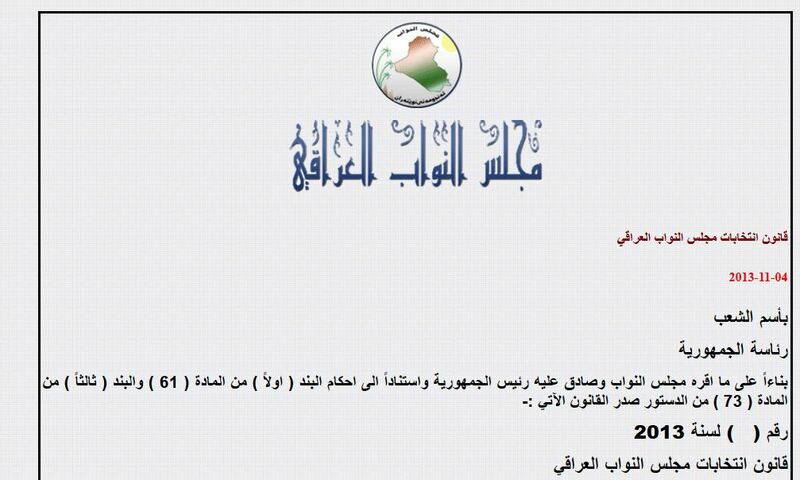 Coinciding with the expiry of the extended deadline for registering political entities for the April 2014 parliamentary elections (and following approval of changes to the electoral system), a list of 142 entities certified by the Iraqi elections commission so far was released today. It is possible that there will be last minute additions, but most of the big players are included, suggesting the list gives a good picture of the parties that will take part in the elections. That being said, one should perhaps not look to this list with too much in the way of expectations about answers to what the political landscape will be like in the next general elections in Iraq. During the run-up to the previous elections in March 2010, it became clear that it was the subsequent announcement of coalitions – expected to take place in December this year – that proved significant as a harbinger of the electoral frontlines. Nonetheless, it is worth taking a closer look at this material. Starting with the Shiite Islamists, all the big parties are in there, and there is also evidence of the persistence of some of the internal subdivisions within the State of Law alliance that came to the fore in the local elections this year. Thus, firstly there are Ahrar (Sadrists), Risaliyun (Shahmani), Fadila, Badr, Hizbollah in Iraq (Sari), Muwatin (ISCI), Iraq National Congress (Chalabi), Muwafaq al-Rubayie, Daawa (Tanzim al-Dakhil), Daawa (Maliki), Daawa (Tanzim al-Iraq), Daawa (Haraka), Independents (Shahristani), as well as State of Law somewhat incongruously registered as an “entity” in the name of Haydar al-Abbadi (the same thing happened before the local elections and it is a little unclear why they are registering the coalition as a party). Independent Sabah al- Saadi, formerly of Fadila and with notoriety for his battle with PM Maliki, has his own party; the Shaykhi subsect of Basra is also running an entity of their own (Amir al-Fayiz). And then there are small parties of people with ties to State of Law: Ali al-Dabbagh, Shirwan al-Waeli and Haytham al-Jibburi. Some of these managed to win seats in the local elections in April. By continuing to exist as recognizable entities, they also signify potential centres of gravity catering for the same electorate that Maliki has appealed to in the past. Finally, two ministers considered close to Maliki that are running separate parties may perhaps be considered in a different light since they appeal to voters outside the Shiite Islamist base of Maliki. They are Sadun al-Dulaymi (Sunni Arab) and Turhan al-Mufti (Turkmen). 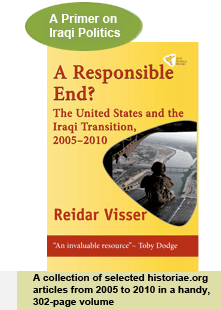 Turning to the secular-Sunni circles that in the past have been associated with Iraqiyya, an even greater degree of formal fragmentation can be seen. There is no entity called Iraqiyya as such. What was formerly Wifaq of Ayyad Allawi is now registered under the name of Nationalism (Al-Wataniya). Then there is the Mutahiddun list of parliament speaker Nujayfi , the Future party of Dhafir al-Ani, the small party of Hussein al-Shaalan, as well as a flurry of small lists associated with the defections from Iraqiyya in parliament that happened mainly in 2012 before and after the targeting of Vice President Tareq alHashemi. These include already known entities like White, Hall, Free Iraqiyya and Wataniyun, but there are also separate entities associated with figures like Ahmad al-Masari, Mustafa al-Hiti and Talal al-Zubayie. Saleh al-Mutlak does not appear to have registered a separate list, whereas it is noteworthy that the Iraqi Islamic Party (Sunni Islamist) has reappeared after it lost greatly to Iraqiyya in 2010 and was of little significance in the local elections in April this year. Two significant omissions must be mentioned. For some reason, the Kurdish KDP party is not listed. Unless this is intended as grandstanding by Masud Barzani (who has hinted at the possibility of boycotting the elections), this presumably relates to a technicality. Also it is unclear whether a list loyal to Asaeb Ahl al-Haqq group, the Sadrist splinter group that has more recently flirted with Maliki, is included in this material. There is no obvious connection through name, but the party leadership has vowed it will run in the next elections. All in all, it is the nature of an entity list of this kind that a fragmented picture appears. The list is a collection of potentials, and people who may intend to join coalitions at a future stage may have registered separately simply because of their own hubris. It is the coalition list that will truly count, and that is expected in December. Ever since the Iraqi parliament passed changes to the Iraqi electoral system on 4 November, doubt regarding the exact status of the action by parliament has lingered. In theory, the legal uncertainties concerning the nature of the piece of legislation passed by the government are such that parliamentary elections – now scheduled for late April 2014 – may be postponed or even canceled in a worst case scenario. A juxtaposition of two snippets from the Iraqi parliamentary website – one on the day of the passage of the changes, and another featuring the website as it is today – highlight some of these ambiguities. On the day the law was passed, parliament published a legal text with the headline “law proposal for the revision of the electoral law no. 16 of 2005”. Conversely, today the headline for the same law simply reads, “election law for the Iraqi national assembly”. The more recent version of the document is helpful in sorting out some contradictions that were present on the day the law was issued. In particular, it seemed strange to call the legislative act an amendment of the existing law, since article no. 47 of the newly passed piece of legislation specifically abrogated the law from 2005! But whereas semantics may be to blame in that respect, the distinction between a “law proposal” and a standard law is not so easily resolved. That is so because over the past couple of years, the Iraqi supreme court has developed something of a pet issue regarding the exclusive right of the executive power in Iraq – the cabinet and the president – to introduce legislative projects to parliament. An independent right of parliament to initiate legislation is not recognized, and the court has consistently struck down as unconstitutional all “law proposals” that have been brought to its attention, always citing article 60 of the Iraqi constitution. It seems clear from all accounts that the new Iraqi electoral law that was passed last week was indeed a mere “proposal”. It reportedly originated from the legal committee in parliament. As such, it has not passed through the executive power, and it would be perfectly analogous and compatible with past precedent to have the law struck down as unconstitutional by the supreme court if anyone complained. Crucially, such a formal complaint now reportedly exists. It has been reported that an exiled Iraqi named Ayyad al-Bazi has submitted a complaint to the supreme court, precisely on the grounds that the new law is a mere proposal and therefore unconstitutional according to the court’s own jurisprudence. Remarkably, at the same time, all major Iraqi parties insist they are looking ahead to elections in April next year. The State of Law bloc of Prime Minister Nuri al-Maliki has said it was against the removal of the “largest remainder” method for calculating seats, but did not press the issue. For their part, the optics of the rapidly changing drafts of the law proposal seem to tell a story about quite intense horse-trading behind the scenes. First, of course, during the revision of the local election law in late 2012, it was thought the standard Sainte Lague method would offer the enhanced proportionality demanded by the supreme court after its review of the original election law from 2005. Then, in a draft for the changes to the general elections law published by Al-Mada in July, the D’Hondt proportional formula, which is slightly more beneficial to bigger parties, was used. Finally, all of a sudden, a so-called modified version of Sainte Lague was inserted in the law passed last week. “Modified Sainte Lague “ is already in use in several democracies including Norway and Sweden, with the first divisor of the votes aggregated by each party seat at 1.4. This gives bigger parties more advantages than a pure St. Lague would give (as in the Iraqi local elections law). Notice, though, that Iraq has created its own version of modified St. Lague, with the first divisor raised from 1.4 to 1.6, giving even more to the larger parties. (Also, unlike for example Norway, there are no longer any compensation seats at the national level in Iraq to reduce disproportionality.) This all smacks of a bazaar logic, and one cannot help wondering whether some of it represents a concession to Maliki, who was deeply unhappy with St. Lague in the local elections law. One must also wonder how the Iraqi communist party, who started the drive towards a more proportional system through a complaint to the supreme court, feels about all this. There has been much confusion about the new changes, with some alarmist reports out of the United States suggesting that the threshold for representation has gone up dramatically. This is not the case: There is no longer any “electoral divider” (qasim intikhabi) by which total votes are divided by seats available in each governorate to set an official cut-off point for representation. That was an aspect of the largest remainder method that no longer comes into play. However, simulations of the 2010 results strongly suggest that the communist party would remain unrepresented under the new system as well. 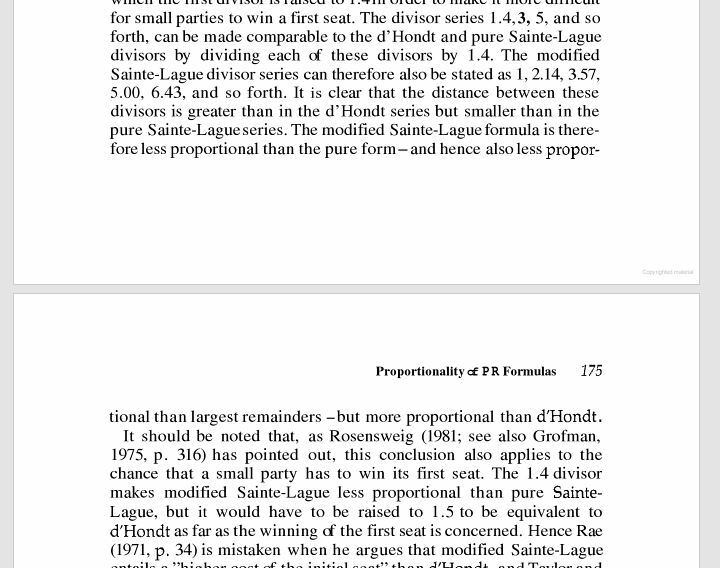 Indeed, Arend Lijphart, an internationally recognized expert on democratic theory and electoral systems, considers modified Sainte Lague with a divisor 0f 1,4 less proportional than largest remainder, meaning that Iraq with its even bigger divisor of 1.6 has moved even further away from the proportionality of the original system. The communist party could thus legitimately complain to the supreme court again, since the new legislation has done little to address their claims and possibly has made for a worse situation from the proportionality point of view. Rather than changing the formula, the key to better proportionality would probably be either more national seats or a single constituency – the latter is mostly rejected by Iraqi parties because of its other disadvantages. In any case, now that Mr. Ayyad al-Bazi’s appeal has been lodged with the federal supreme court, something is there that can potentially be used to cancel or delay the elections, or be used as a means of pressure by those who are less eager to hold elections than others. On the surface, then, Iraq seems on track to polling in late April, with a deadline for political entity registration set for next week. Once more, though, Iraq’s supreme court could become embroiled in politics, and its track record of staying above Iraqi factionalism has not been a terribly good one during the past few years. As Prime Minister Nuri al-Maliki visits Washington, highly polarized narratives about the nature of his rule in Iraq compete for attention. Maliki himself focuses on reintegration in the Arab world, growth in oil production, and a modicum of internal stability that is only disturbed by the situation in Syria. Some American senators see things very differently, accusing him of authoritarianism and a failure to create a truly inclusive government. In the most extreme iteration of this point of view, Maliki is seen as contributing to the problems in Syria because of the ways Iran is allowed to use Iraqi territory in their efforts to bolster the Assad regime. It may be worthwhile to use current developments on the Iraqi political scene – unfolding day by day as Maliki visits Washington – as a yardstick for evaluating these very different interpretations of his premiership. These days, Iraqi politicians are busying themselves with amendments to the country’s electoral system. They are trying to pass a brand new election law that will incorporate changes to the current law from 2005 following criticisms from the federal supreme court. If this fails, they will simply make yet another amendment to the existing one – but the independent electoral commission IHEC has warned that it needs to do so fast in order that technical preparations can be completed before elections can go ahead in April 2014. The optics of this aren’t entirely unfortunate for Maliki. Far from intervening in the squabbles in the Iraqi parliament which began this week and continue on Saturday, he is far away in Washington, not at all fitting the description of him as a paranoid, control-freak autocrat that is terrified of challenges to his rule. The debate about the election law itself has also degenerated into basic haggling over seat allocations to the various provinces, quite similar to what we saw in the autumn of 2009. Initially, there had been prospects for more radical changes to the districting system, but what we are seeing now is a replay of disputes that are four years old, and that mainly relate to the preference of the Kurdish parties to use the population statistics from the ministry of planning rather than those of the ministry of trade. Using the planning ministry figures would increase the number of seats in parliament from 325 to 351, which the Shiite Islamists in parliament have opposed in particular. Most likely a solution will eventually be found, and most likely it will involve some kind of opaque compromise in which statistics will be subordinated to the horse-trading efforts of Iraqi parliamentarians. There is however one important caveat here that ultimately also relates to the evaluation of the current state of Maliki’s Iraq. What has failed to receive much attention is the fact that the law that is currently being considered by the Iraqi parliament is a brand new law proposal, rather than amendments to the existing law. As a “proposal” or muqtarah it has not been approved by the cabinet, and the most recent trend has been for the Iraqi supreme court to strike down this kind of proposals as incomplete legislative acts – something it has done in particular when new laws have been to the disadvantage of Maliki. Moreover, since the current iteration of the election law from 2005 has also been deemed unconstitutional because of its seat distribution formula, there is a theoretical possibility that Iraq will be without a valid election law if anyone challenges the new law proposal. Maliki might do so if he wishes to delay the elections, although there would be a highly ironic twist to this in that Maliki’s allies are the ones who favour the seat distribution key of the 2005 law that has since been deemed unconstitutional by the supreme court and is the reason the law is being revised in the first place. At any rate, if this kind of scenario should materialize, it would clearly support the interpretation that Maliki is unafraid of the Iraqi parliament because he chooses to ignore it, relying instead on rulings by the supreme court that consistently strengthen his hold on power. The reality, as ever, is of course somewhere between these extreme, black and white interpretations. And the parliamentary elections of 2014 will in many ways decide which of the two scenarios prevails in the long term. Instead of seeking to impose particular preferences regarding Iraq’s electoral system or fetishizing the question of a third term for Maliki, Washington should use the visit of the Iraqi PM to provide the him with a gentle reminder that Iraq’s problems cannot be reduced to spillover from Syria alone. Whilst there is nothing in the Iraqi constitution or democratic theory more broadly that stands in the way of a third term for Maliki, a failure on his part to build a broader and more inclusive electoral alliance could prevent him from succeeding for the third time. This is not the same as saying that any new government should be a power-sharing one (as opposed to a political-majority government). It just implies that Maliki’s State of Law coalition in its current configuration looks very far from being capable of securing a majority in the next Iraqi national assembly, quite regardless of which method is adopted to count the votes and how many seats are allotted to each of the provinces.